In among the madness of getting our bags finished in time to pack to go away, I was also trying to get a quilt made. It was started around a similar time as the bags – four weeks pre-trip. I had a layer cake and two charm packs I planned to use, and after lots of back and forth on the design, I settled on a simple plus quilt. I sliced the layer cake into quarters, and got busy laying it out, and was quite pleased with the result…until I did a quick calculation and realised I was too short by a pretty decent amount. By decent I mean not even a double size quilt, for a queen sized mattress. The fabric I was using was a Moda range called “Mod Century”, that’d I’d picked up from a couple of friends destashing. Even when it was new and in print, it would have been very unlikely I would have found it locally (the joy of living rural! ), but out of print it was a completely lost cause. I ummed and ahhed. I annoyed my family by leaving it laid out all day, and thinking on it, but in the end I only had one option – to add solids. I wasn’t convinced, to be honest, I loved how it was looking, but my mum ended up talking me off the ledge of giving up and trying something else. When I put my disappointment to one side, I could see the solids would probably be an improvement, if anything. The fabric was so busy, the quilt could do with the visual break that the solid sections would provide. If, that is, bright red and orange could be considered restful. The finished quilt ended up taking 2 charm packs, one layer cake (cut into quarters), plus 40cm each of blue, green, red, and orange, and 20cm of a tone on tone grey (as I couldn’t get a solid in the right tone). With the benefit of chain peicing, I had the top together in an afternoon. Once basted, I headed out to a meeting with quilt and perle cotton in tow and got half the solid pluses hand quilted. The days disappeared and I knew the other half of the pluses I wanted to quilt wouldn’t get done, so I sewed on the binding, and as much as I am a hand binding snob, I machined down the binding. I have had pretty mediocre results previously, so this time I tried a tip from Stitched In Colour and used a zig zag stitch and it made such a difference! I won’t be doing all my quilts with machine binding, but it’s a game changer for those times I need something done quickly. Between the simple design, precuts, chain piecing, light quilting and machine binding, it turned into a quilt that was a lot quicker to put together than I would’ve expected – with a good solid bank of time, I can see this being a quilt that could be knocked out in a weekend, especially with simple machine quilting instead of my chosen hand binding. 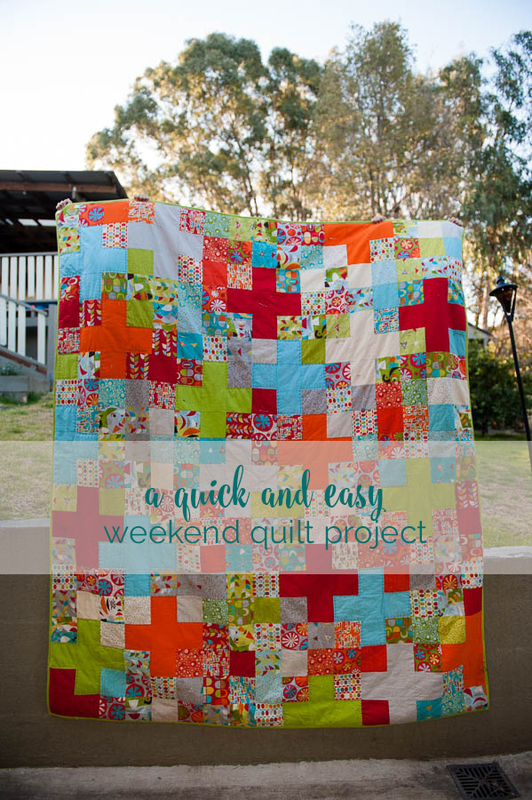 That is not, though, me saying I would do a quilt this large on a super tight time frame, as I’ve been known to do with smaller lap quilts. Remind me of that if I start thinking about it, ok?